In the last year, CAHA has produced significant reports on health and energy policy, with the release of the Position Paper and Background Paper: Health and Energy Choices, and Coal and Health in the Hunter: Lessons from One Valley for the World. It has advocated strongly for emissions reductions to protect health, and to achieve co-benefits for health. CAHa has continued its strong and effective national and international partnerships, and further expanded the Pacific Region of the Global Green and Healthy Hospitals network, with the appointment of Chris Hill, Sustainability Director at Mater Health, being seconded to the role for one year. CAHa developed a Climate Resilience Standard for Healthcare, conducted two national events: a Public Seminar on Health and Climate Change with UNSW School of Public Health and Community Medicine in Sydney and the Greening the Healthcare Sector Think Tank in Brisbane. CAHA continued its call for a national plan on climate and health, and further expanded it network and social media following. In this report, we share the activities and campaigns that have contributed to CAHA further developing its national and international reputation for leading a dynamic agenda of advocacy on climate and health issues - underscored by a high level of professionalism and scientific rigour. What a busy year! 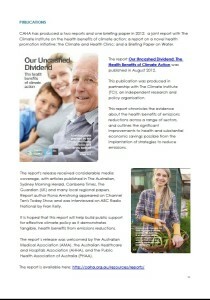 The Climate and Health Alliance has helped kick-started a sustainable healthcare agenda by co-hosting the Greening the Healthcare Sector Think Tank with AHHA; helped launch the Global Green and Healthy Hospitals Network in Australia with Health Care Without Harm; released an important report with the Climate Institute - Our Uncashed Dividend: The Health Benefits of Climate Action; and led the development of a global statement on climate and health: the Doha Declaration - signed by hundreds of organisations representing millions of health professional around the world, calling for health to be prioritised in global and national responses to climate change. Read all the details here! Our first ever! The Climate and Health Alliance has accomplished a great deal in its first year. We've been to Canberra and to Durban, got some of the country's most significant healthcare stakeholders on board, produced some important papers and shared lots of resources on climate and health, distributed our newsletter to hundreds of subscribers, influenced the advocacy of other groups with the health' message, inspired others to take action, and established important partnerships with other stakeholders. Read all about it!